Celebrating birthdays are always amazing opportunities to create special family moments that become engraved in your memory forever. 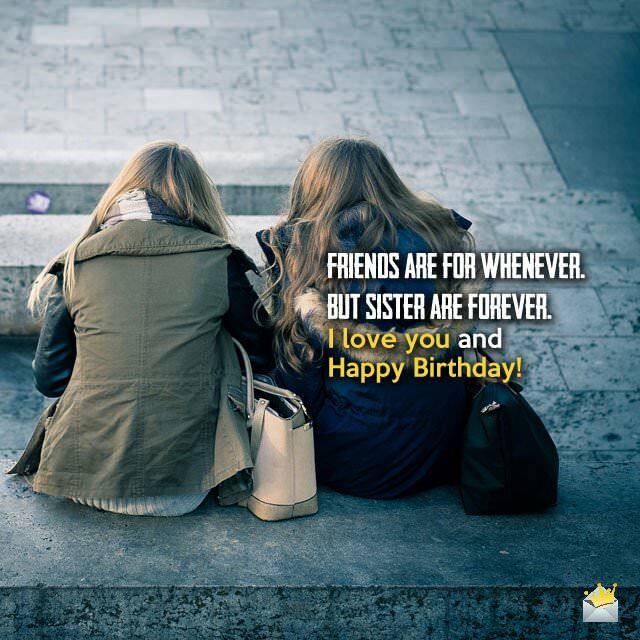 If you are looking for the right words to make the birthday of your sister special, try some of these thoughtful birthday wishes. Happy Birthday to you and congratulations on having the best sister a girl could ever ask for. More Funny Birthday Wishes here! Let’s have fun pretending we’re good girls in front of our parents. But as soon as their gone, we are going crazy for your birthday! 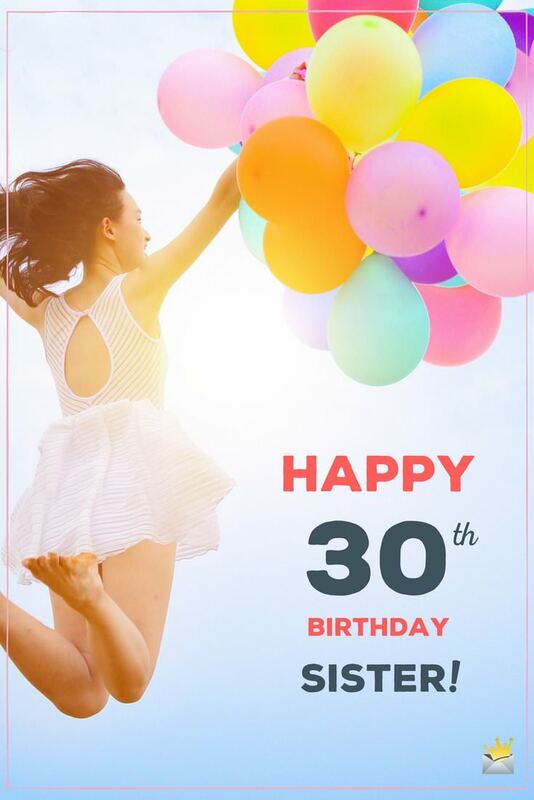 Happy Birthday, Sis! You’re not just my sister- you’re my crazy best friend, drinking buddy, a cup of awesomeness, and you deserve a huge birthday cake – to share! Happy birthday to you! Dirty secrets and lots of tears. Those things always come before the joy and laughter we share together- but I guess it’s worth it, right? Anyway, happy birthday to a one of a kind sister. I used to think that you were just born bossy, then I realized you were just born first- so I guess you’re off the hook since you were just being a big sister. Happy birthday to the bossiest best sister. I know that if I’m ever in trouble I can always call you- because the only thing crazier than me is my sister! Happy birthday to you wild thing. Having you for a sister is like having a crazy best friend that just won’t go home. Happy birthday crazy best friend. I have learned so much from you. I have looked up to you all my life. You are a positive role model and the best sister I could ever ask for. I hope your birthday brings you lots of love and joy. Friends are for whenever. But sisters are forever. I love you and Happy Birthday! 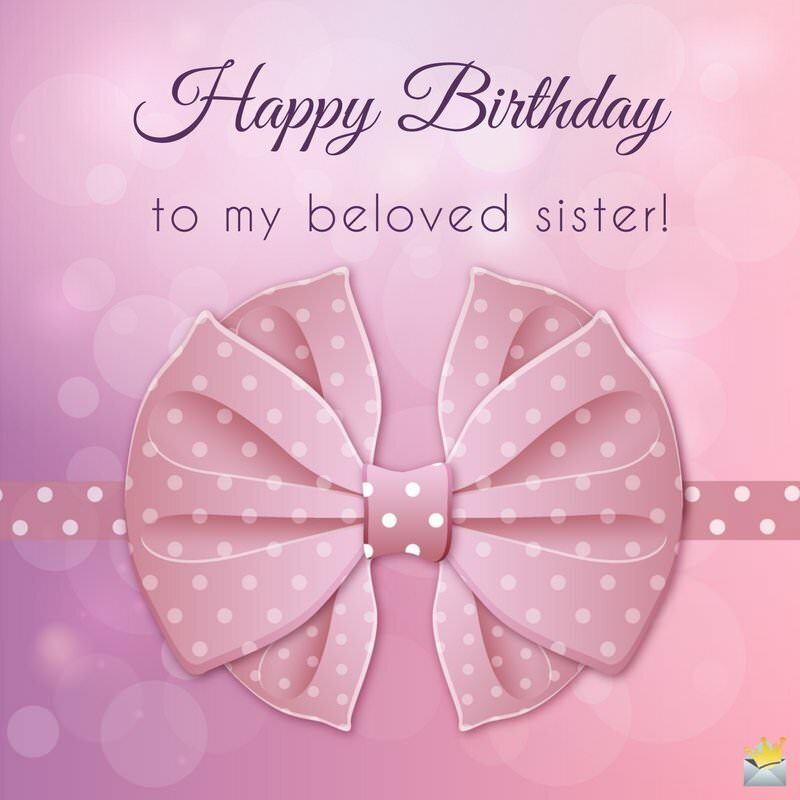 Heartfelt wishes to my sister, on your birthday! May this occasion be grand! May it hold only the greatest memories! I am so proud to be related to you. Happy Birthday, from your loving brother! Growing up with you was the best! I am grateful to have a loving and caring sister like you! Happy Birthday! 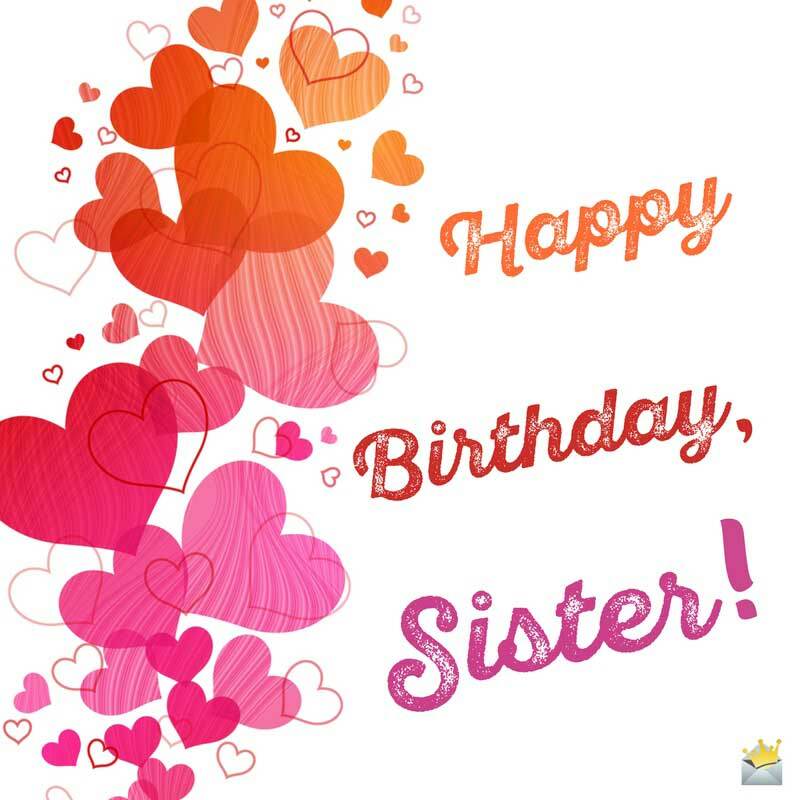 Your birthday is a special day in our family, sis! It notes the day when someone who is truly magnificent was born! Happy Birthday! To the person I have shared my toys and secrets with, Happy Birthday! May this special day be amazing! Have a stellar, fantastic, extra special birthday you deserve! I love you , sis. Who’s the best sister ever? YOU are! Sending you lots of love and bear hugs on your birthday. Hope it’s the best one yet. They say that friends come and friends go- that’s why I’m so glad my best friend is my sister. And that’s you! Happy birthday. They say spending time with your sister is like going back to your childhood for a short time. Those memories can never be lost and neither will the bond we share. Happy birthday. Having a sister to talk to and laugh with is a blessing! On your special day, may you feel understood, joyful and loved! Happy birthday to my sister: the queen of all hearts, including mine. I love that we get to play dress up together and still laugh about boys. I love how even though we fight we are always there for each other at the end of the day- because we are sisters. Thanks for being such a great sister and a loyal friend. Happy birthday. You’re a birthday star! You will surely go far. Happy Birthday to you! I wish you a wonderful birthday. May all of your wishes and dreams come true. Wish for the stars because you have no limits! Happy Birthday to my lovely sister! Happy birthday to my beautiful sister: Remember that your greatest qualities are the ones that show the true character of your heart. To the birthday girl: You have the wonderful gift of lighting up every room with the hope and love that resides inside you. Never change that. Happy Birthday. Best of birthday wishes to you. Reach for your dreams because I will always be here to cheer you on at the finish line. Who needs coffee or an energy drink? Having a sister like you brings me the laughter and the hugs I need to get me through the day. Sisters like you make the world a better place to live in. I love you bunches! Happy birthday! 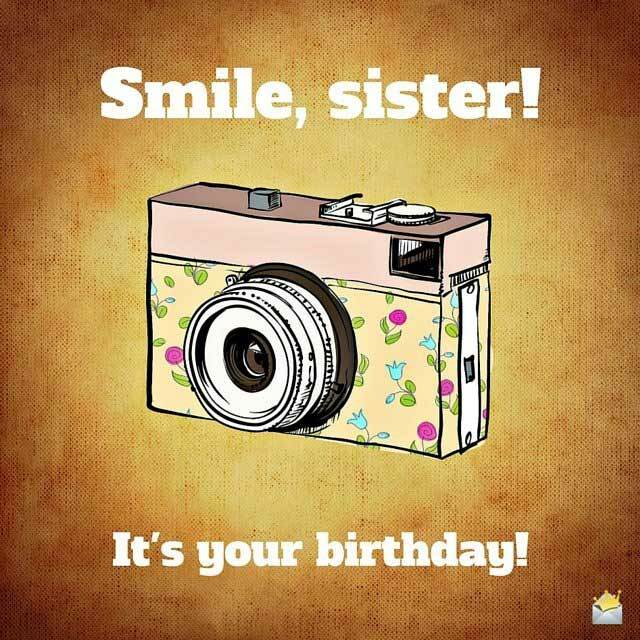 Happy Birthday to you, Sis! You possess such strength and you are a woman of integrity. You remind me of our amazing mother. Happy Birthday, to my big sister! You have always encouraged me to accomplish my goals. May you reach all of yours, not just on this day, but every day that follows! Smile, sister! it’s your birthday! Sis, you are the strongest, most capable woman that I know! My greatest wish for you, on your birthday, is that the knowledge of this fills you with pride! Cheers to my sister, on your birthday! Endless possibilities await you! I have no doubt that you will continue to do great things! Happy Birthday, sis! May your efforts make all of your hopes and dreams come true! Today marks the birth of a sister who is strong! You will confront any challenges that are presented to you, this year, and you will overcome them! Here is to another year of taking charge and forging your own way, sis! Happy Birthday! Happy Birthday, sis! I hope you view yourself the way I view you: as a fantastic member of our family who has already made a difference in this world, and still has so much more to offer it! You have done so much, sis! On your birthday, look forward to all you have yet to do, and know that all of your brothers and sisters are proud of you! On your birthday, sis, always look to the future! Everything that you want is available and lies ahead of you! Without your influence, sis, I would not be able to make it through difficult situations in my life! I hope that your birthday finds you well! I hope that if difficult situations occur you will make it through them, victoriously! There are no mountains too high or oceans too wide for you to cross or climb. That’s how awesome you are, sis. Happy birthday. Even though geography separates us these days, I’m with you everyday in my heart- because we’re sisters. I love you and wish you the happiest birthday of all. Happy birthday, sis. As you celebrate your birthday, remember that we have an unbreakable bond, and no matter what, I will always be there for you! Although I have moved to a different state than you, my heart is still with you, sis! Have a very, Happy Birthday! 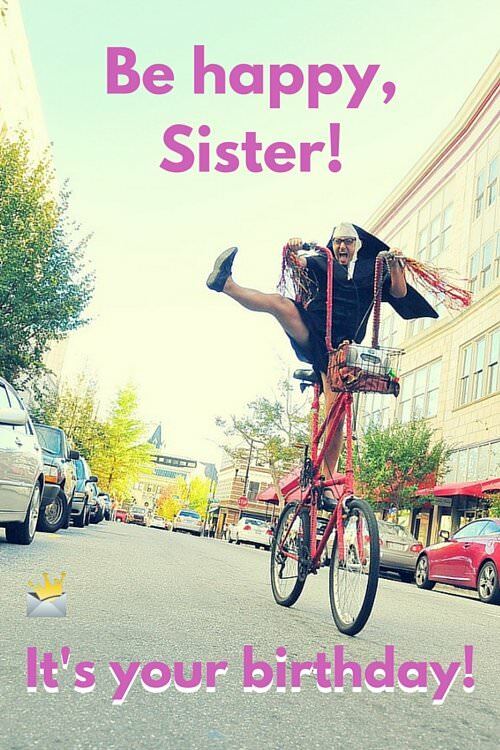 Be happy, sister. It’s your birthday! I am just a phone call or text away from you! You are eternally my sister! Happy Birthday to someone who I hold dear! Reading your letters make me smile! 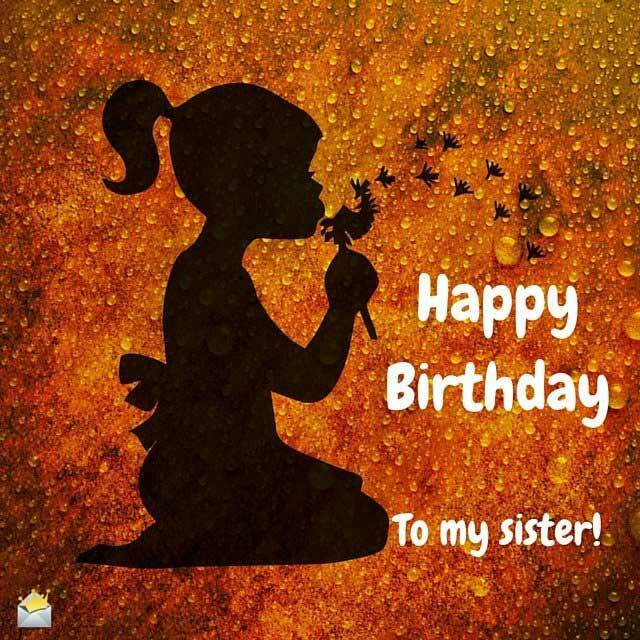 On your birthday, sis, I am wishing you happiness! Whether we are talking on the phone, texting, or Skyping, we will remain to keep in touch! 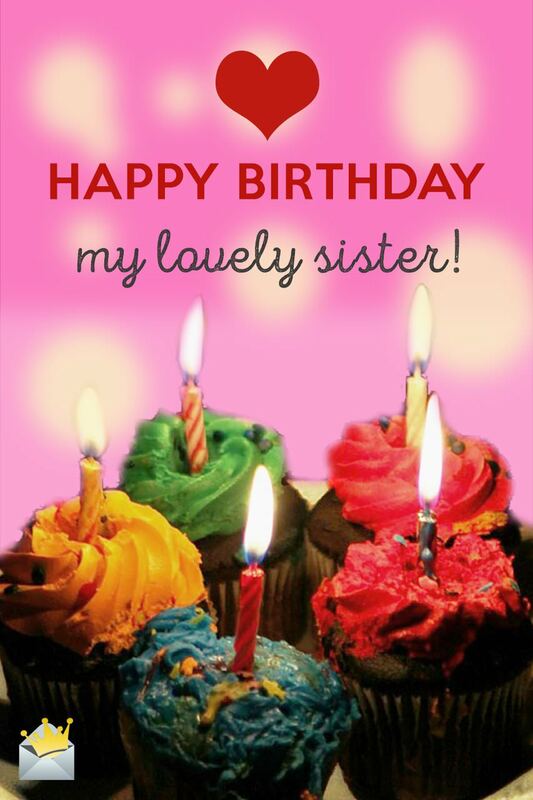 And even though I am not there to commemorate your birthday, sis, know that I am thinking about you! Moving for a job is never easy, but having a sister like you is! Happy Birthday! You have calmed my nerves and reminded me that I can do this! Happy Birthday! Keep following your dreams and always believe in yourself. Cheers to turning 16! Today is your big day, and we shall celebrate it accordingly. I wish your sweet 16th birthday will bring lots of joy and happiness into your life. Happy birthday. Sixteen years on planet Earth is really a milestone, my dear sister. I hope today comes with it nothing but events that fill your heart and soul with joy. Happy 16th birthday, Sis. 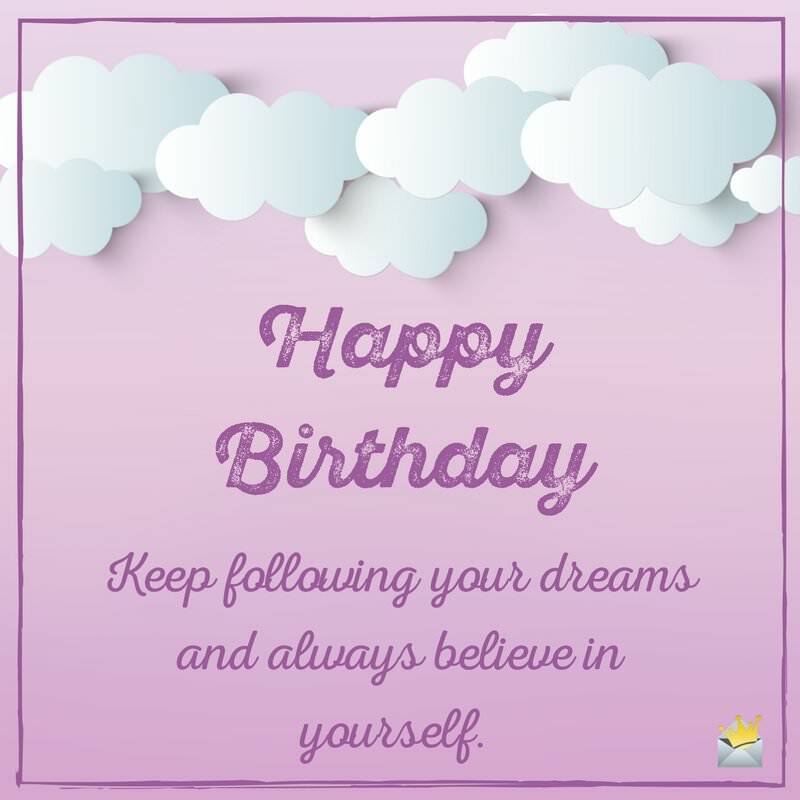 May your birthday be loaded with a whole lot of fun-filled events and plenty of cakes to mark a new beginning in your life. Enjoy your 16th birthday, my beautiful sister. Being 16 is one of the most exciting phases of a person’s life. Happy birthday, my sweet sister. May your day be full of exciting gifts and happiness. For my sweet and precious sister at 16, I wish you grow to become one of the most important women in the world. Happy birthday. Sis, you are the most remarkable 16 year old that I know. As you mark your 16th birthday today, continue to stand tall in life. Happy birthday, dearie. Happy 16th birthday, sweet sister. May your life forever blossom like flowers in May. On your special day, may your life be more colorful than the rainbow you bring into my world. Happy 16th, my beloved sister. 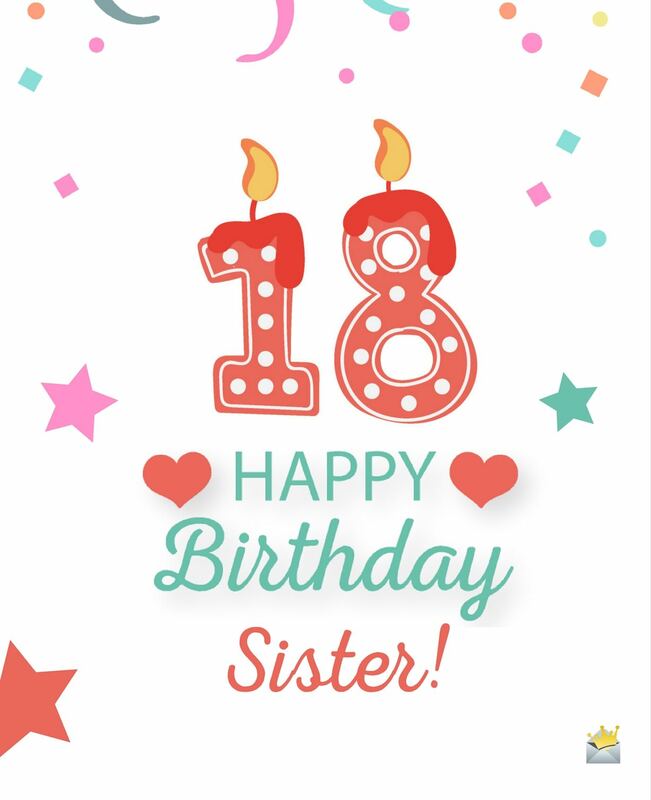 Dear sister, may you be blessed with joy and happiness on the occasion of your 16th birthday and on all the days of your life. Have a blissful day. On your 16th birthday, sister, I’m wishing you a life full of magical moments. Never stop believing in yourself, my dear. As you commemorate your 16th anniversary, may your happiness be beyond imagination. Happy birthday. Happy 16th birthday, sister. Wishing you all the happiness from all the cardinal points of the world. Love you. 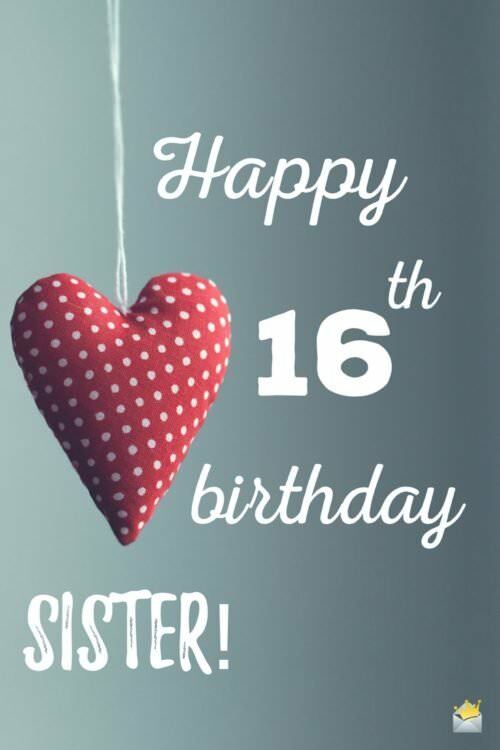 Happy sweet 16th, beloved sister. May you be blessed with the sweetest things in life, and may you always see and experience things that make you smile. You are the sweetest 16-year-old in the whole wide world. I can bet my life on that. I hope that your birthday will be as sweet as your life. Happy sweet sixteen. Congratulation on your 16th birthday. May happiness rule over your life for eternity. Happy birthday to my dearest sister at 18. I wish that many doors of opportunities open for you as you step into this new and exciting chapter of your life. May your birthday gifts come in packages of eighteen beautifully wrapped boxes today. Happy birthday to my darling sister at 18. Wishing you an enjoyable and very fabulous 18th birthday party today. And as you celebrate, do know that I love you always. Happy birthday, dear. Happy 18th birthday to my pretty sister. As you metamorphose into an adult today, may you live well enough to enjoy the best of the beautiful things this world has. Happy birthday! It’s your 18th birthday today, and I am glad to be a part of the celebration. As you embark on this journey of life as an adult, may your years be filled with good relationships that will beautify your adult life. Darling sister, I have watched you grow into a pretty little damsel over these years. Have a fantastic birthday today as you prepare for the interesting life as an adult. Yay! You’re officially now an adult! Happy 18th birthday to my adorable sister. I wish you a prosperous future devoid of headaches. Love you so much. Happy 18th birthday to my wonderful sister who proudly becomes a fully-fledged woman today. Dear sis, may success and happiness always be within your grasp. Have a truly beautiful life. Wow! You make 18 look so fabulous! May every day of your life be as fabulous as you are. Happy 18th. Happy birthday to my dear sister who is both a teenager and an adult. It is my wish that your life will sparkle and shine brighter than a diamond. Happy 18th. As you celebrate your transition from a girl to a woman, know that you always fill my heart with pride. I hope your 18th birthday will be as spectacular as your life. Happy 18th birthday. May good fortune smile on you today and rule over your world until the end of time. Just like a river always flows into the sea, may happiness always flow into your heart. Happy 20th birthday. Congratulations on turning 18 today! On this great day, it’s my hope that nothing but good things will find their way to your door. May you see success in everything you do. I am so happy to share the great occasion of your 18th birthday with you. May you always be surrounded by true friends and happiness. Enjoy every moment of your new life as a woman. Bravo, you’ve finally made into adulthood! I hope every brand new day of your life in the adult zone will fill your loving heart with joy and contentment. As you mark your 18th birthday, it is my wish that your life will be filled with the colors of the rainbow. Happy 18th. Wishing my gorgeous sister a gorgeous 18th birthday. I hope you have a spectacular life. Happy birthday to the youngest and most amazing 20-year-old in my life. Dear sis, it’s my prayer that as you celebrate this milestone birthday, you will receive nothing but the choicest of blessings from above. Wishing an ecstatic birthday to my wonderful sister who turns 20 today. I wish you a prosperous and fulfilling life as a 20-year-old. Cheers to 20 beautiful years of existence, dear sister! I wish you a rocking 20th birthday celebration. Happy 20th birthday, my sweet sister. I wish you a life filled with smiles and laughter. May you forever see and enjoy all the beautiful things in this world. Dearest sister, as we celebrate the official expiration of your teenage years today, may you forever walk in glory. Welcome to the first day of life in your twenties. The real pleasures of life begin from this age. Enjoy it to the max. Happy 20th. As you say goodbye to your teenage years and welcome your twenties, may your blessings in life come at supersonic speeds and be as uncountable as the grains of sugar. Happy birthday. Wishing a fabulously happy 20th birthday to a phenomenal sister. It’s a great honor being your sister/brother. Happy 20th birthday. Wishing you peace, good health and joy all the days of your life. Wishing a bright and memorable 20th birthday celebration to my loving sister. Dear sis, regardless of the fact that you still can’t legally drink, there are oceans of reasons that make turning 20 amazing! I hope you enjoy all the magical moments of this age. Happy 20th birthday. Wishing you a glittering and happy life accompanied by good luck. Congratulations to you, my beautiful sister, on your 21st birthday. The mere fact that you are turning 21 today in such great health and grace really brings a lot of joy to my heart. Happy birthday. I love you. As you look forward to a new life as a young lady, do realize that life is a precious gift from God and enjoy every moment of it. Sending lots of love and blessings your way. Happy birthday. Yay! At long last, you’re legal! You can now legally do all the interesting things that you’ve always wanted to do! Have a wonderful 21st birthday my sweet sister. Being 21 is one of the most exciting chapters in a person’s life. I hope you realize how lucky you are and enjoy this special day to the fullest. Happy birthday, sis. Happy 21st birthday! Since turning 21 only happens once in a lifetime, we shall celebrate this day like nobody’s business. Put your party shoes on because we are going to party all night long in celebration of you! I can’t believe three decades have passed already since you were born. As you mark yet another lovely moment on earth, may God bless you with everything that puts a smile on your face. Enjoy your day to the max. Happy 30th birthday, Sister. Thirty years on planet earth shows that you are beginning to carry more responsibilities of life on your shoulders. As you mark your 30th birthday, I pray your shoulders become stronger to carry those duties darling, sis. Have a fabulous birthday, my lovely sister. Hopes, dreams and aspirations come alive around this age in one’s life, and that is what makes this age so special. As you mark your 30th year on Earth, I wish all your dreams and aspirations become a reality before the next decade. Happy birthday, my sweet Sis. Thank God for winning the struggles of life for a whole 30 years. As you open another chapter of your life, I pray that God keeps giving you the strength to remain a winner. I love you, my sweet sister. Happy birthday 30th birthday. Happy birthday to my sweet and fabulous sister. Today is your day. It’s all about you and nobody else. As we celebrate you today, I pray for God’s blessings in your life. May you live to see all the desires of your heart come to pass. I love you so much. I know that fulfilling your dreams at a time like this becomes an important goal in life for you. 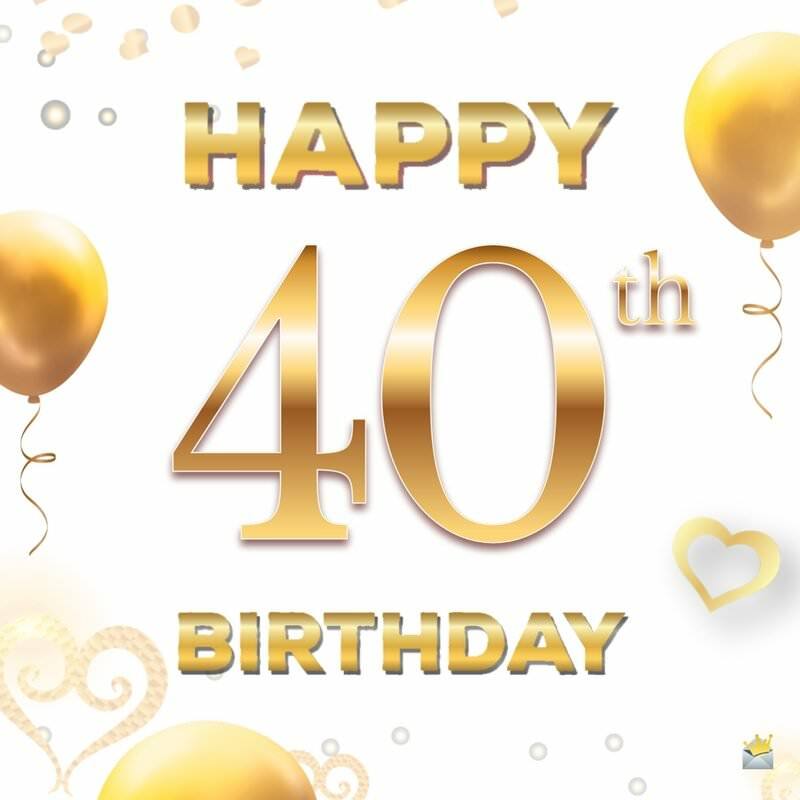 As you celebrate forty years of life, may those dreams become a reality. Happy birthday, darling sister. Lovely sister, may all your dreams in the last 39 years get fulfilled as you celebrate this very special day of yours. Happy 40th birthday, my dear. Dear sister, it is a delightful thing to know that the 30s of your years are over. Welcome to a new beginning in all spheres of your life. I celebrate you. Happy 40th birthday. My lovely sister, as we wave goodbye to your 30s, let us welcome in grand style the arrival of your 40s. Happy wonderful birthday. May all your goals and dreams always be within your grasp. Not old. Classic. Happy 50th Birthday. Hurray! Your golden jubilee year is here. I can’t believe you are 50 years old today! What’s your secret to looking this astonishing? I’m so blessed to have a sister like you. Happy 50th birthday. There are over 7 billion people in the world. That is a fact. It’s just like the fact that my sister keeps getting more and more beautiful and awesome as she ages. Happy 50th birthday, dear sis. Wow! Five decades on earth is no joke at all. I wish you mark another five decades again in good health and happiness. 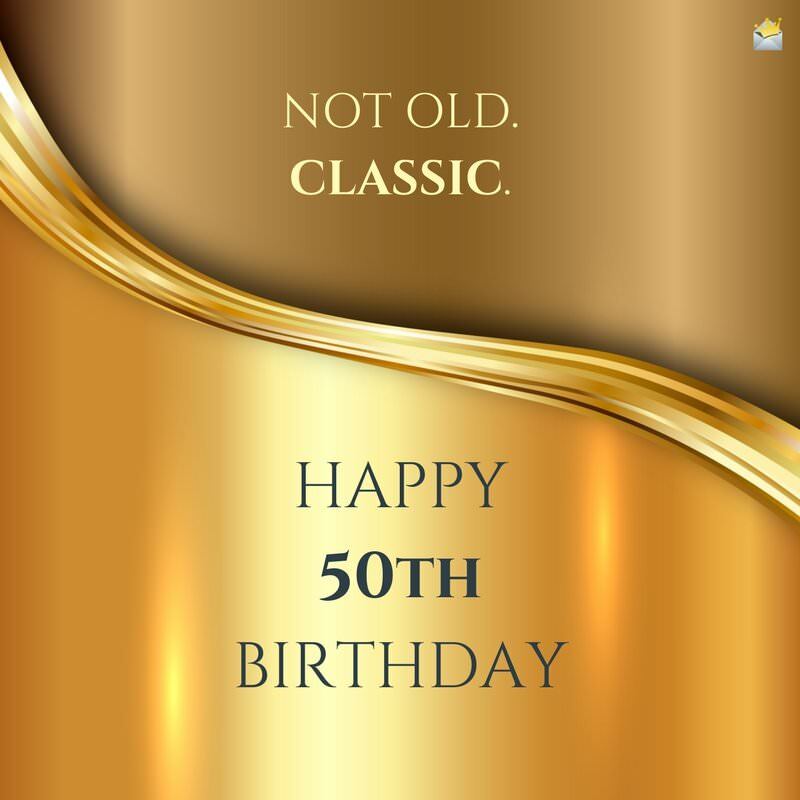 Happy golden 50 years. Happy 50th birthday to my adorable sister. I wish you all the best that your heart yearned for in the last forty-something years. God bless you. Happy birthday to the world’s most wonderful sister. Though you are 50 today, you don’t look it at all. Keep enjoying your golden youthful look. Stay blessed. 60 years is long enough for someone to become accustomed to life’s issues. I pray your loving memories in life will dwell with you as long as you live, while the bad ones will fade away. Happy glorious 60th birthday, dear sis. Happy birthday to my darling sister, who is 60 years old today but looks decades younger. I wonder what your secret is. I hope you continue to age with such grace, good health and beauty. I love you so much. Turning 60 is such a big deal, and I’m so glad to have the opportunity to share this special day with you, my dear sister. My wish for you today is that you celebrate so many more awesome birthdays in good health and happiness. Cheers to 60 years, dear sis! 60 is just a number. You are still as beautiful and wonderful as ever. Happy 60th birthday to you! Have a fabulous day! 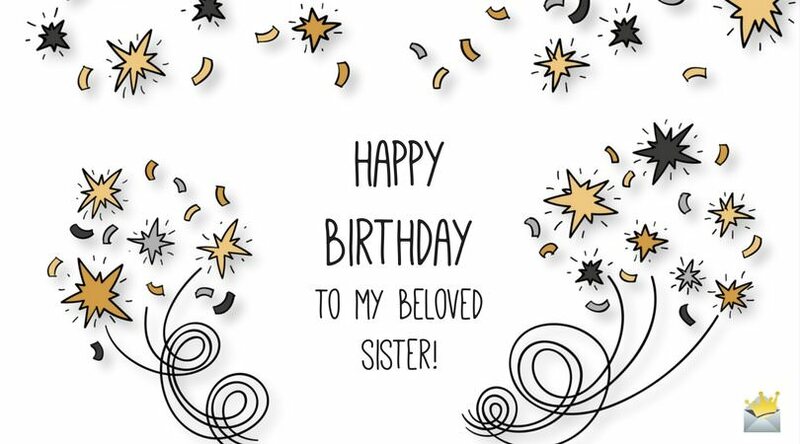 Watch & share this short birthday video with your sister!